Sheehan Gallery now hosts a rare opportunity to experience art by all of the Whitman studio art department faculty in one space. 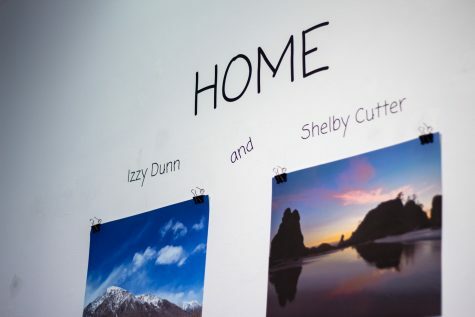 This Whitman Studio Art Department Faculty Exhibition opened on January 22 and will remain up until April 6. 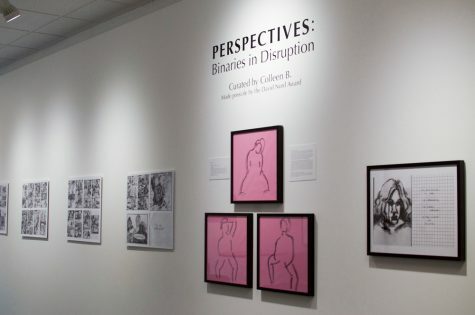 The exhibition features works by professors working with a range of mediums. The result is a diverse spread of work, ranging from sculpture, prints and ceramics to painting, photography and new genre art. Each professor’s unique approach offers a new way of looking at art. For Professor Richard Martinez, his paintings are based in process: choices in terms of color, texture, scale and composition. Martinez spoke about the way his paintings emerge through the choices he makes as he works on them, often producing a different result than the idea he might have started with. Much of his process, Martinez says, is based on intuition. As he works, he goes with what he feels is right. There is not an agenda at work. Consequently, there is not a single, correct way of looking at and interpreting his work. Professor Daniel Forbes’s work in the gallery, on the other hand, conveys more of his specific, personal experience. 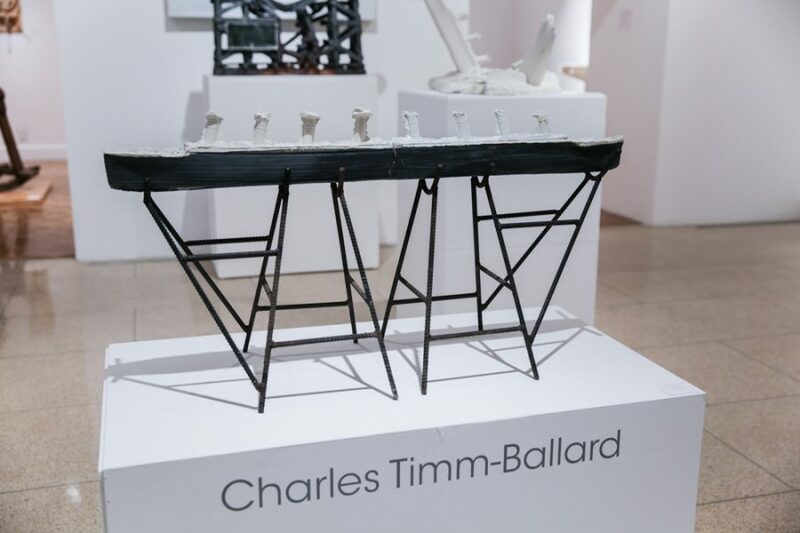 Displayed in the gallery are people and figures built from a variety of objects such as ordinary household objects, decorative pieces and kitchenware. His motivation behind the pieces is the original story of Pinocchio, and the aspect of transformation into a masculine identity present in it. His pieces, then, contain stories of his own experience. Forbes has done assemblage work for a long time, and the nature of this work—collecting shapes and fitting them together like a puzzle into works of art—speaks to these experiences built into these pieces. “It’s very meaningful that all of these things were created and ascribed a value and a function in society by whoever their previous owner or user was. And then through this reconfiguration, to be able to give them a new way of operating sort of allows them to overcome what people prescribed as their original intention and to transcend that to something else,” Forbes said. Forbes hopes that his work not only gives viewers much to think about, but also that it will evoke certain feelings. Additionally, while most of the pieces have stories attached to them, they are valuable in themselves as pieces to look at with interest and awe without knowing their backgrounds. “My hope is also that they’re just interesting enough to look at in terms of formal aspects, that people will find them interesting,” Forbes said. 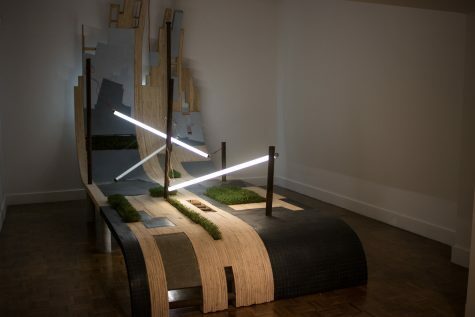 Professor Maria Lux’s approach to her installation similarly challenges ways of thinking, but differs from both Martinez’s and Forbes’s works in its basis in research and scientific studies. Lux’s art centers around animals, and for her installation in the Sheehan Gallery, she focused on two famous studies. One surrounds the work of a research assistant named Margaret Howe, who lived in a flooded house with a dolphin named Peter and tried to teach him English, eventually leading to a sexual encounter. The second is the story of Lucy, a chimpanzee who was raised as a human by the Temerland family and grew more comfortable around humans than around other chimpanzees. Lux created a bathroom, complete with a bathtub in which sits a dollhouse inside a fish tank to represent Peter’s story. Joined to the bathroom is a bedroom, where a terrarium sits. Inside is a small chimpanzee representing Lucy, surrounded by Playgirl and National Geographic magazines, which the real Lucy enjoyed looking at. Lux also created her own “Dreambook” magazines, in which she explains the two studies. The dreamy, idyllic quality of the magazines speaks to the optimism science can have. Lux was interested in how each of the studies happened in the domestic space as opposed to a laboratory, and how that factor connected with them being sensationalized especially for their sexual aspects, leading to many of the other parts of the study being ignored. Lux hopes that her installation challenges the way people think about such controversial studies. Lux also spoke about the value of displaying her work in this academic setting, where other professors and students are studying many kinds of things. There will also be chances to learn more about other faculties’ work in the gallery. Throughout the exhibition, a series of individual artist talks will take place, with times and dates to be announced on the Sheehan Gallery website and the Whitman Events Calendar.